1. Preheat oven to 350°. Spray 9 X 5-inch loaf pan with nonstick cooking spray. In large bowl, lightly beat egg. Add remaining meatloaf ingredients and gently mix until just combined. With rubber spatula, evenly spread turkey mixture in prepared pan. Bake 30 minutes. 2. In small bowl, whisk together glaze ingredients. Spoon glaze over top of meatloaf. 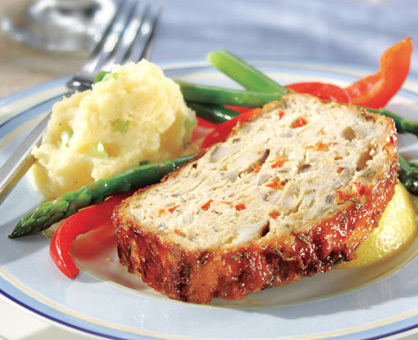 Bake meatloaf 30 minutes longer or until internal temperature reaches 155°. Let stand 5 minutes before slicing.